A TECHNOLOGY COMPANY BUILDING… HOMES? Silicon Valley is a location and a mindset. It’s the origin of world-changing inventions spanning semi-conductors to electric cars. It’s also a place where traditional industries are disrupted to make room for a better customer experience. The concept of disrupting housing—an industry that has seen almost no innovation in hundreds of years of American history—using advanced technology, was certainly counterintuitive seven years ago. Now? My old colleagues, as well as the general public, are beginning to see the connection between housing and high tech. At Blu Homes, we pride ourselves in our identity as a technology company that builds homes. We started in 2008 with research out of MIT, and like many tech companies out of Boston we moved West due to growing demand from California. In the early years we focused on product design and building science R&D. In product design we focused on solving the key “problem” of building homes with huge expanses of glass, high ceilings, and big open spaces… that could also be packed up, shipped hundreds of miles, and put up on site at a relatively low cost. We supported this with R&D – both on a unique steel-reinforced building system that supported the folding and delivery system, as well as information technology tools that connect the manufacturing back end to digital tools that let customers design homes in 3-D, with fixed prices. So we’ve been busy. And now, after six years of R&D and hundreds of customer projects completed—not to mention a lot of learning—we are launching a retail strategy that aligns with our tech-based business model. Where better to test this out than in Silicon Valley? This month we’ll open our first retail design center in Redwood City, California. It’s a 24,000 square foot prototype located at 888 Douglas Avenue in Redwood City. And perhaps most importantly, to speak with experienced team members about project design, timing, and financing. We are excited to serve our customers with the Silicon Valley Design Center. We envision it as a space where customers can get all their questions asked, explore our models, and use Blu’s technology tools in a relaxed retail environment—either by appointment or by just stopping in during open hours, 7 days a week. Why do this in the heart of California’ innovation center? Like any prototype, we know we’ll need to iron out all of the details before rolling out retail centers in our other major U.S. markets: the greater Bay Area, Los Angeles, and the Northeast. And since Silicon Valley is known as the epicenter for daring new ideas and business models, it’s a perfect fit for this tech company that builds homes. 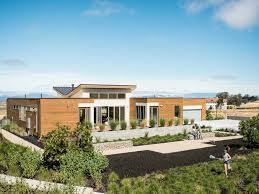 Venture Capital, High Tech, Virtual modeling, and Millennial appeal what more could you want from a home building company designed to revolutionize the market for modular homes. Seriously, if their PR and marketing can drive a market perception that building modular is an eco-friendly energy saving solution for the planet who can argue with the concept. Anyone who has ever worked at Blu could argue with that concept. Ms McCarthy and Mr. Haney are living in a fantasy world that they created and that only they perpetrate. The company is a joke.